It is very rare that I find an article that expresses my concerns so well. 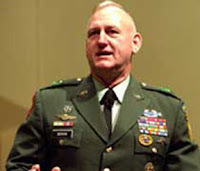 This article, written by retired Lieutenant General William G. Boykin, gives us detailed and accurate information about the threat that Iran poses for this country. Gen. Boykin has worked in the CIA and was the U.S. Deputy Under Secretary of Defense for Intelligence, so I think he knows what he's talking about. He was a Co-Founder of Delta Force, although a Fort Bragg psychologist wanted to exclude him because he was "too religious." Seems like just the kind of guy I'd want in our elite military forces; what about you? "We as believers have been promised that we will spend an eternity with God. Last Saturday, I was doing a men's conference in Fredricksburg, Virginia and I was praying during the worship service and something dawned on me and it was the Holy Spirit speaking to me. And the Holy Spirit said, "this is what I want you to share with My men today", and I'm going to share it with you and this is what it is: One day, we're going to stand before the gates of Heaven. Some of us want to be able to walk up there in a white robe and we want to sing Abba Father and Amazing Grace and we want to say to the Lord, "I worshiped You." But I want you to think about this: Here's the way I want to enter the gates of Heaven. I want to come skidding in there on all fours. I want to be slipping and sliding and I want to hit the gates of heaven with a bang. And when I stand up and I stand before Christ, I want there to be blood on my knees and my elbows. I want to be covered with mud. And I want to be standing there with a ragged breast plate of righteousness. And a spear in my hand. And I want to say, "Look at me, Jesus. I've been in the battle. I've been fighting for you." Ladies and gentlemen, put your armor on and get into battle. God bless you. " Mahmoud Ahmadinejad, the Iranian president, is clearly a calculating and shrewd man with an apocalyptic theology. As a Shia “Twelver,” Ahmadinejad believes that the Islamic messiah, or Mahdi, will only return when the world is in chaos and when there is global strife and bloodshed. His theology suggests that the returning messiah will establish global Sharia (Islamic Law) and restore peace according to Shia Islamic religious dictates. The other power base in Iran, the Supreme Council, shares that theology. Headed by the Ayatollah Ali Khamenei, the Supreme Council consists of Shia clerics who share the theology of the president of Iran. A nuclear weapon gives the Iranian President a means of achieving his ultimate goal of ushering in the reign of his Mahdi. Current Iranian missile capabilities possess the range to reach Tel Aviv, which has been the primary target of Ahmadenejiad’s vitriolic rhetoric, consisting of threats of annihilation of the Jewish state. An attack on Israel would create a huge problem for the United States. Whether or not America responded with military, economic, and diplomatic assistance for Israel, the U.S. economy would feel the devastating effect immediately. Any turbulence in the Persian Gulf region will drive crude oil prices up, striking a significant blow to the fragile global economy, including that of the United States. But there is also a threat to the American homeland that is even more sinister. Iran considers the U.S. a huge impediment to achieving its goal of a global caliphate (Islamic super-state). Called the “Great Satan” by the Islamic regime, like Israel, America is a target that Iran wants desperately to destroy, or at least to devastate. Current Iranian missile technology does not give Iran the capability to reach the shores of the U.S., although that technology is improving rapidly. That said, it is important to understand that there are other ways to attack America using the current capabilities of Iran that could result in death, destruction, and disruption of the American way of life. Iranian sponsored Hezbollah is currently operating in Mexico in cooperation with the drug cartels. These terrorists are infiltrating the U.S. across the southern border with help from the cartels who move their drugs through large unprotected sectors of the U.S. border. U.S. Border Patrol efforts to stop infiltration into American Border States have been severely impeded, due primarily to environmental regulations. Large corridors through National Forest areas are unpatrolled or are patrolled only on horseback or foot while infiltrators are able to use vehicles to bring contraband into the outskirts of cities like Phoenix. The Border Patrol now estimates that it only stops roughly five to ten percent of the illegal border crossing traffic coming out of Mexico. Given the ease with which the cartels move illegal drugs into the US, it is reasonable to assume that terrorists are doing the same, including moving dangerous materials. That could easily include nuclear waste from the Iranian nuclear program or even a crude nuclear device. Nuclear waste is a precursor to what is commonly referred to as a “Dirty Bomb,” meaning a bomb that is detonated with conventional explosives surrounded by nuclear materiel or waste. The effects are not the same as a nuclear detonation but it does produce low-level radiation and contamination. The primary effect of this type of bomb is psychological. Once radiation was detected, pandemonium would result as people assume that they are being dangerously exposed to lethal dosages, regardless of the true level of contamination. Imagine what would happen if these Iranian sponsored terrorists were to bring a dirty bomb into the nation’s capital and detonate it anywhere near the city center. It would shut down the U.S. Government as Congress, the Supreme Court, and the Executive Branch evacuated the city in haste, trying to leave across a series of bridges that would rapidly become bottlenecks. Although the U.S. Government has plans for the continuity of operations of the various branches of government, they are relatively untested and focus primarily on the Executive Branch. There would be a substantial delay in reconstituting the other branches of the government, as the huge civilian workforce would be reluctant to return to a city with residual contamination. America must get serious about protecting its borders. These terrorist cells operating in Mexico at the direction of the leadership of Iran pose a huge threat but the administration seems to be oblivious to it. We can no longer consider border security as just a problem of illegal immigration. It is now a matter of protecting America from a severe terrorist attack. Psalm 91:1-2 "Whoever dwells in the shelter of the Most High will rest in the shadow of the Almighty. I will say of the LORD, “He is my refuge and my fortress, my God, in whom I trust." Hi, there's no link to the article. I would very much like to read it. Thanks. There is no link to the article because I printed the entire article within the post. The headline "Iran's Nukes and Homeland Security" is the title of his article, as I mention right before that. Enjoy reading!